Bethel Park High School and Independence Middle School students combined to win 10 medals at the Family, Career and Community Leaders of America’s State competition, which was held in March at Seven Springs, including two Gold Medals, five Silver Medals and three Bronze Medals. Earning Gold Medals and qualifying to compete in the FCCLA National Competition, which will be held this summer in Anaheim, CA are Bethel Park High School freshman Haley Bell for her project, “Garbage Cans to Rain Barrels” in the Environmental Ambassador category, and Independence Middle School seventh grader Lexi Dorfner for her project, “Dorfner Family Christmas Party” in the Life Event Planning category. Silver Medals were earned by Bethel Park High School sophomores Caitlin Chichwak, Jessica Toogood and Tessa Wagner for their project, “Sweet Ride Cookies” in the Food Innovations category, and sophomore Alyssa Vetere for her project, “Reuse, Recycle, Refashion” in the Recycle Redesign category. Silver Medals were also earned by Independence Middle School eighth grader Bella Riepole for her project, “Becoming a Pediatric Nurse” in the Career Investigation category; eighth grader Ella Morgan and seventh graders Emma Haner and Allyson Yantek for their project, “Tasty Pastry Puffs” in the Food Innovations category; and seventh graders Lauren Vetere and Alyssa Headley for their project, “Bounce Back to Proper Nutrition” in the Sports Nutrition category. Earning Bronze Medals were eighth grader Layla Goodman for her project, “Germ Patrol” in the Focus on Children category, eighth grader McKenna Carlin and seventh grader Delaney Puskas for their project, “Helping Hearts for the Homeless” in the Chapter Service Project Display category, and seventh graders Lidia Lorenzi and Samantha Kern for their project, “Cooking Up Happiness” in the Illustrated Talk category. 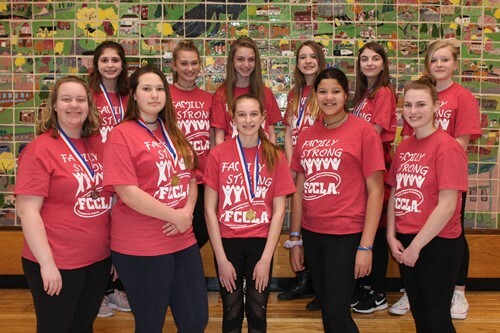 The Independence Middle School FCCLA Club also received the Chapter Award for having the largest percentage increase in membership at the Middle School level throughout the state. The students were prepared for this competition by Bethel Park High School Family and Consumer Science Teacher Jill Simpson and Independence Middle School Family and Consumer Science Teacher Heather Fontana.